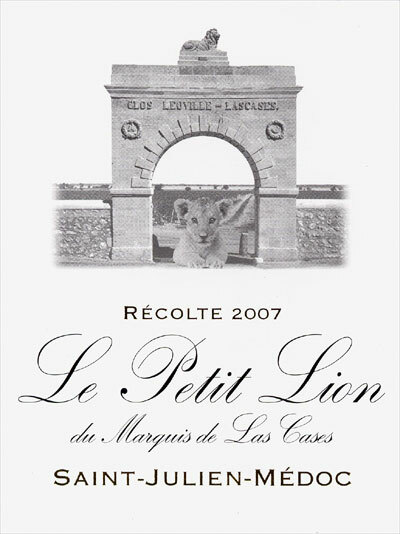 Today Château Léoville-Las-Cases announced the birth of a second wine, Le Petit Lion du Marquis de Las Cases, the 2007 vintage being the first year for this new wine. A smart, yet logical step. Until today the Clos du Marquis was regarded as the estate's second wine, but other than with most second wines the Clos du Marquis is in the first place a different wine. It was created long before the vast parade of Bordeaux second wines arrived, the first vintage of the Clos du Marquis being 1902! With the arrival of the Petit Lion the two old wines are now explicitly presented as "first wines", the Léoville-Las-Cases of course remaining the estate's Grand Vin (there can only be one Grand Vin). The most important part of the former Léoville domain (before Léoville-Barton and later Léoville-Poyferré were split off) was, and is, the walled "Grand Clos" which lies directly South of Latour. Today this famous vineyard produces the fruit for the Léoville-Las-Cases. The Clos du Marquis vineyards are situated more to the West, further away from the Gironde. If you want to read about this in more detail, check out Chris Kissack's website, he's also a nice little map showing the two separate vineyards. The new second wine will be more like most second wines: made from fruit that for quality-reasons is not (yet) fit for the first wine. In this specific case: some parts of the Grand Clos have been replanted recently, and the berries from the young vines are now harvested for the Petit Lion. Whereas Léoville-Las-Cases is a marked vin de garde, the Petit Lion is meant to be uncorked earlier. What helps: the high proportion of merlot (85%) in the blend - the remainder being cabernet sauvignon. The wine matures for 12 months in French oak, of which 10% new barrels. Yields are around 40 hectolitres per hectare. It seems the consumer price for this wine will be around 30 to 35 euro's. I will be at the château on March 30 and perhaps - besides the primeurs - the Petit Lion will be presented as well. I'm curious, and I will keep you up to date. Note: it is possible to pre-order this wine via Bolomey Wijnimport. Bordeaux 2009 here we come!